I don’t know about you, but I think it’s time for another chocolate fix! Wait. Belay that! It’s always time for a chocolate fix! 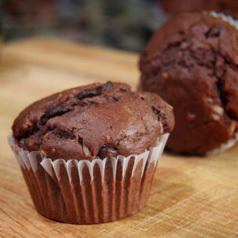 These muffins are light, chocolate — and blessed with additional chocolate (chips) and just a sprinkling of coconut. Preheat oven to 400°F. Grease or line muffin pan. In large mixing bowl, combine dry ingredients, chocolate chips, and coconut. Make a well in the center. In a small mixing bowl, beat the eggs, water, and oil. Add all at once to flour mixture and stir just until moistened. (Do not overheat, or your muffins will be tough!) Spoon batter into prepared cups, filling each three-fourths full. Bake about 18 minutes or until a toothpick inserted in the centers comes out clean. Cool in muffin cups on wire rack for 5 minutes. Remove from pan.